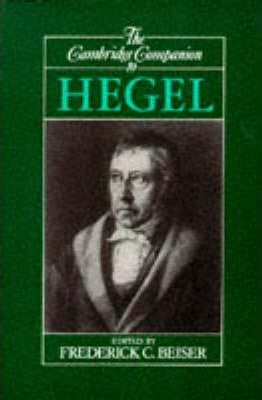 Few thinkers are more controversial in the history of philosophy than Hegel. He has been dismissed as a charlatan and obscurantist, but also praised as one of the greatest thinkers in modern philosophy. No one interested in philosophy can afford to ignore him. This volume considers all the major aspects of Hegel's work: epistemology, logic, ethics, political philosophy, aesthetics, philosophy of history, philosophy of religion. Special attention is devoted to problems in the interpretation of Hegel: the unity of the Phenomenology of Spirit; the value of the dialectical method; the status of his logic; the nature of his politics. A final group of chapters treats Hegel's complex historical legacy: the development of Hegelianism and its growth into a left and right-wing school; the relation of Hegel and Marx; and the subtle connections between Hegel and contemporary analytic philosophy. Introduction: Hegel and the problem of metaphysics Frederick C. Beiser; 1. Hegel's intellectual development to 1807 H. S. Harris; 2. You can't get there from here: transition problems in Hegel's Phenomenology of Spirit Robert Pippin; 3. Hegel's conception of logic John Burbidge; 4. Hegel's idealism: the logic of conceptuality Thomas E. Wartenberg; 5. Hegel's dialectical method Michael Forster; 6. Thought and being: Hegel's critique of Kant's theoretical philosophy Paul Guyer; 7. Hegel's ethics Allen W. Wood; 8. The basic context and structure of Hegel's Philosophy of Right Kenneth Westphal; 9. Hegel's historicism Frederick C. Beiser; 10. Hegel on religion and philosophy Laurence Dickey; 11. Hegel's aesthetics: and overview Robert Wicks; 12. Transformations of Hegelianism, 1805-1846 John Toews; 13. Hegel and Marxism Allen W. Wood; 15. Hegel and analytic philosophy Peter Hylton.